Day Three was a biggie. I tackled the bathroom. This included four drawers in the vanity and two medicine cabinets (essentially his and hers) and also the area around the stacker washer and dryer. Day Three is where I hit a bit of a wall. Right away it was pretty evident what my part of the clutter was. Samples. 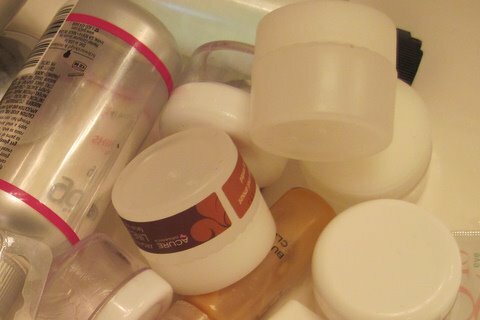 You know, those little complimentary bottles filled with creams and conditioners that you get when you stay at a hotel. That, and trial sizes and freebies of different beauty products. Of course, I have to save them because “if I go away” it will be more convenient to have them (not considering that “if I go away” there will probably be a fresh set of little complimentary bottles in the next place). Also because, if I go away and actually fly someplace, having those little bottles in your carry-on to go through airport security is a necessity. Except that also in these drawers was a large plastic zip-lock bag of little self-filling travel bottles and jars I had bought just for that reason….filled with unidentified creams and gels from the last time I flew, which was a while ago. And some of these trial samples were for things I would never normally use anyway. So I was mercilessly clearing them out. Well, OK, I wasn’t that merciless. Because every little sample of anti-wrinkle This and scented That which I picked up, I then had to try before tossing. This slowed down the process a little, also leaving me with a very shiny face and an aroma of sorts while I worked. There is a strong tendency here to get sidetracked. It’s just too easy for that to happen. But I did discard anything that smelled bad, or weird, or looked discolored, which included a number of facial masques. It’s funny because I don’t do facial masques, I think because I don’t have the patience to apply them and wait. But I have fantasized about having a “girls night” (guys can join in) where a bunch of us – not sure who Us necessarily is – would do beauty masques while watching movies and eating popcorn. Over the years, these face masques saved for the fantasy occasion had hardened into cement in their tubes. Toss. I also discovered a stash of new toothbrushes, which you can never have too many of. Kept those. Disposed of a multitude of expired prescription medication. The medication is a whole other issue. Those who know me well are aware I have had a habit of hoarding old meds, in the event that “The Revolution” happens. I am not sure which kind of Revolution that might actually be, but I figure it’s good to have every kind of medication possible just in case you may need some. I will say that over the years a number of friends and family have been especially grateful for this practice during an emergency – when a tooth has broken, a back has suddenly gone out, a UTI has started, a massive migraine, allergy misery, or an abcess has developed during a weekend, holiday, or while uninsured. Despite contrary thought, it is my opinion that even expired medication is better than no medication at all if you are in the midst of either an emergency or a Revolution. However, the stuff I tossed was not particularly necessary to much of anything one might need for either, so that was easy. Now I have to mention what kind of clutter the Significant Other had in his drawers. Eight packages filled with those individual dental flossers …..just in case you find yourself at a marathon corn-on-the-cob eating contest. Or perhaps this is his own personal emergency stash for the Revolution. 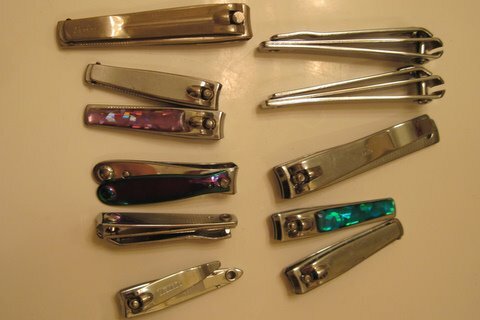 And eleven nail clippers. They are all over the house. I bet there are fifteen or twenty nail cl ippers lying around this place, but eleven were in the bathroom drawer. It is of note here that this is not hoarding behavior. This is about losing something in a drawer full of junk, needing it and buying it again, losing it, buying it again, losing it, over and over and over again. As the S.O. does not put much energy into searching for things, this theme will probably be recurring throughout the project. Five bottles of expired eye drops for getting the red out, dating back to expiration in 2003 (what was he doing in 2003)? Five boxes of unopened, expired allergy pills. About fifty loose effervescent tablets meant for cleaning dentures – and he doesn’t have any dentures. Two fossilized hair brushes that looked like someone had been brushing out the undercoat of a dog. Three night lights. A package of stainless steel drawer knobs. Four pairs of scissors. And an assortment of sheet rock screws, metal brackets and some other unidentifiable metal hardware. This part of the chore was actually a bit amusing, honestly. There was a great feeling of satisfaction when I finished with the His Side and My Side drawers, and I meant to move on to Under The Sink (which is an adventure in itself), when a Distraction occurred. 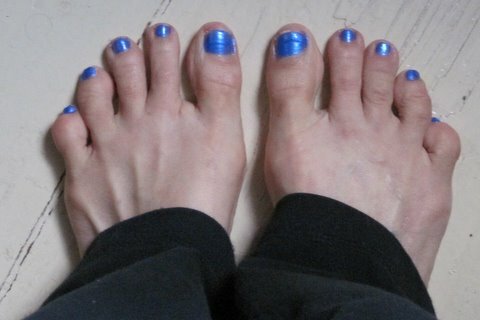 Discovering a bottle of iridescent nail polish that seemed to almost glow in its bottle, I got this sudden urge to try it and wandered off to paint my toenails a Cerulean blue. This sort of wrecked my momentum and I might have just stopped right there, if it was not for a strange nagging voice in my head (which could have been my mother from beyond) saying those same words she said to me long ago regarding focus – that I was “like a little bee that keeps going from flower to flower and not staying on the task at hand”. So OK, I went back to the cabinet beneath the sink. I had no idea we owned a hair dryer, as neither of us uses one, but I found one under there, and a rather large one at that. So whose hair dryer is it? How many times have we had guests here that have asked if we had a hair dryer they could use and I said we didn’t have one? Liar, Liar. Found a can of liquid instant suntan spray…. not familiar. Anyone want to claim it? A couple of empty bottles of rubbing alcohol. A plastic tubby full of expired medication that not even The Revolution would be interested in. Moving on to the shelf on top of the washer, which housed two gallons of bleach, two different detergents, three bottles of cold water wool wash (for all those delicates and woolens which I do not own), five different types of stain remover (all open, almost empty and covered with grease and dust) and an empty box of Borax. When I stood on a chair to see what was pushed to the very back of this top shelf, which is near the ceiling, I found a large wrench belonging to the S.O., which very well may have been there for three years and which seemed to give him at least a momentary thrill when I flourished it. The approximately twenty catalogs sitting stacked on top of a wicker stand in the bathroom also went into the trash. I had to pull myself away from just peeking at one or two of them. The bathroom purge filled four grocery bags. I didn’t get outside of this house for an entire, lovely autumn day. It’s nice to have those drawers cleared out, but it’s also sort of like having a secret, because nobody can see it (and thus I will not be getting any feedback; Feedback being important when you are trying to make a positive change). I am going to have to do some visible de-cluttering in order to really feel accomplished. And so ends Day Three of The Pack Rat Project. Feel free to join in. This entry was posted in Are you kidding me?, Humor, Uncategorized and tagged cleaning up, clutter, de-cluttering, hoarding, pack rat, Stuff, too much stuff. Bookmark the permalink. Thanks, the nail polish was too good a distraction to resist…..with the clippers, you might surprise yourself if you check. In this case, it almost appears as if they breed…. My head was spinning as I read your post here – the amount of stuff we accumulate is astonishing! For the things that we actually paid for – not the hotel giveaways – I couldn’t help but think about those “points of purchase” moments – how much do we spend needlessly. I do think we are hardwired to be hoarders – some more than others…. I did a lot of purging last year – it felt really great to get rid of the dead weight – especially the junk drawer in the kitchen – feels good to be able to see the bottom of it again. One more thing – I so much identified with your purging process – it reminded me a bit of the way I go about gardening too – actually, many of the things that I do – now that I think about it – my family does complain about the way I multi-task. We need little breaks as we make our way through these kinds of tasks – as they are emotionally trying. To take a break and paint your toenails was a healthy thing to do – a divergent approach. You did finish the job, and sounds like you enjoyed yourself! Yes, the bee going from flower to flower…. I hope you give yourself credit for the accomplishments. Some people are unable to even begin without help. I am thinking about REALLY paring down, more and more the longer I am displaced from my lower floor….onward! !